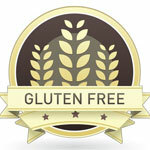 Gluten Free : Gluten-Free for Weight Loss? If you're looking to lose weight in the New Year, you may have heard that a gluten-free diet is the way to go. But is gluten responsible for belly fat? Not necessarily. First, the basics: Some people avoid gluten, the protein found in wheat, rye, barley, and countless processed foods, because they have celiac disease, an auto-immune disorder where the body's immune response to gluten damages the lining of the small intestine. The inflammation triggered by celiac disease can sometimes drive weight gain. Others avoid gluten because of an intolerance. Gluten intolerance mimics the symptoms of Celiac disease, such as abdominal pain, bloating, nausea, and diarrhea, but without the immune response. According to the Cleveland Clinic, there's no evidence that simply avoiding gluten will result in weight loss. A gluten-free diet is not a weight-loss diet. However, eating gluten-free may cause you to eat more whole, nutrient-dense, unprocessed foods such as fruits, vegetables, legumes, and lean meats. These changes in diet are often lower in calories. The bottom line: There is no evidence that gluten alone is a culprit for weight gain, unless you have a gluten-related disorder like celiac disease, according to the Gluten Intolerance Group. But people eating a gluten-free diet tend to make healthier food choices all around because they are more aware of the need to read food labels carefully. Ditching refined carbs and eating more fresh, whole foods, lean proteins, and gluten-free grains will likely make you feel better and have more energy -- and it could very well lead to weight loss over time.